Now it’s time to edit CustomerFormatter class to make our fields visible in the registration form. Of course, you can change the position of new fields and put it wherever you want. Now, extend your Customer model by adding new columns. You can also add there a validation and determine if the field must be required. That’s enough – time for the backoffice. Let’s display our fields in the BackOffice > Customer Settings > Customer Settings. 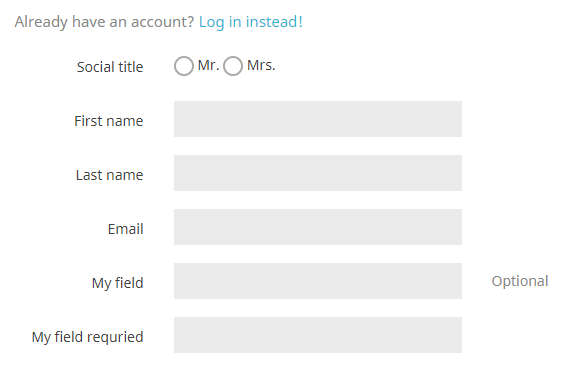 First, you must just add new form fields in the Admin Customers Controller. Look at the code. Time to display the data in backoffice customer page. If you wish to display your field in BackOffice Customer table (in the Customer Settings -> Customer Settings tab), you must edit AdminCustomersController and make it aware of the new field. Last and very important thing is to move all Your changes to override/ directory. That’s it. Thanks for reading. If you face any problem or just want to say “thank you”, leave a comment here. If you like my articles and modules, please consider donation. Hello, Thank's, very simple and work fine. Please tel me why we must move files and edit them? Great and very useful tutorial. Thank you! How can I add dropdown list in CustomerFormatter? Can you provide sample. Thank you in advance! Thank you for the tutorial, it helped me a lot because I was looking for it. But I have one big request. Is there a way to make this field visible only if cart contain at least one product from a list of category set by me? i have one question, why i cant add these fields in address format under the country settings ? Awesome, very good tutorial! Thank you so much! This tuturial ended up being extremely helpfull, thanks a lot. 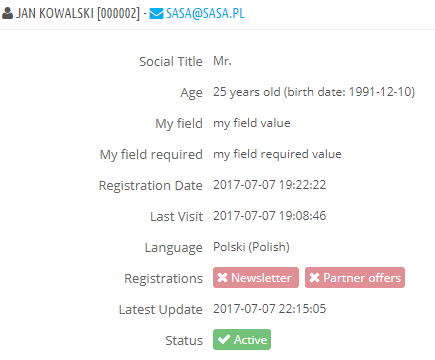 "Remeber that your customers are now able to edit values of those fields in the Information section in the My account page. " Great thank you very clear , works like a charm. I've added a filed named "agent_id_required" as shown in this tutorial. All seems to work correctly. For the translation, I don't find the field :( ...Where I can find ? You are right, it is correct now, there was a typo in filename. Nice tutorial, i'm having problems saving the information in mysql database. When i click the save button in the registration form the information is not stored in mysql, it's blank. Do we have to clean smarty cache to this working? Having same problem as Yan. Hi and thank you for the guide! But im having some troubles with this due to some code not displayed in my CustomerFormatter.php file...or its just me or there is no such code inside as writed in that guide. I've created 4 new columns in my ps_customer table. After that Ive made and added next code as stated in the guide. Nice tutorial, thank you ! How can we translate the 'My field required' ? I can't seem to find it in International / translations. I'm searching in Shop-Forms-Labels but there is nothing there. Kind regards.